Happy Wednesday! It's early August and I'm all ready craving all things fall. I'm pretty sure it's due to the fact that I live in Houston and every day has been almost 100 degrees outside. This Texas heat is no joke and I'm so over it! I can't wait for it to get colder out, for the leaves to change colors, and to start ordering seasonal hot coffees! If you're like me you might be spending countless hours looking at fall clothes online. I do think now is the best time to start stocking up on fall clothes mainly because the weather can change drastically depending on where you live. I wanted to do this post to help make your fall shopping a little easier. 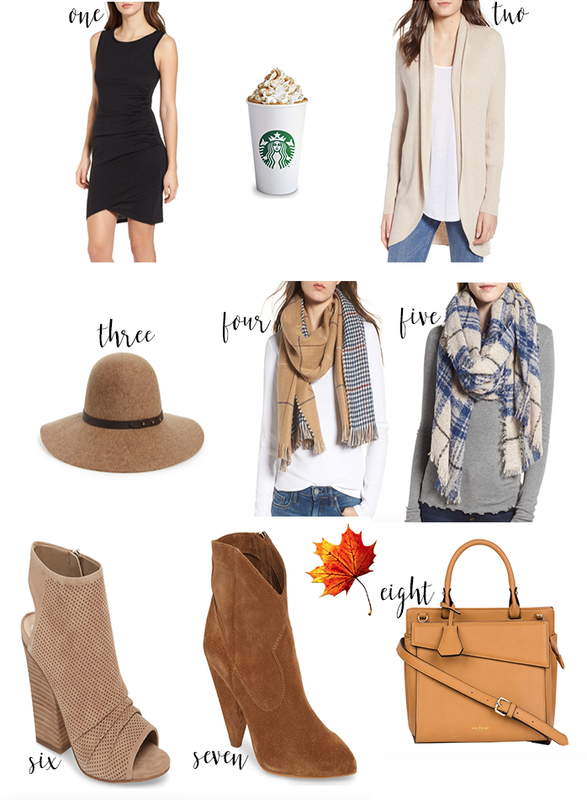 Here are a few of my fall favorites! This is my go-to dress all year long! This dress is perfect in the summer with sandals or wedges, but it's even cuter in the fall with booties and a felt hat! This dress is also great for layering I love throwing a cardigan and booties on with this dress for fall. I bought this cardigan during the Nordstrom Anniversary Sale and have been wearing it almost every day since! It really is the perfect cardigan and is amazing quality. I'll be purchasing this cardigan in a few more colors for fall. I love felt hats in the fall! This one is a great deal for the quality and style. You might have noticed if you follow me on Instagram that I'm obsessed with the color camel. I try to incorporate it into my wardrobe as much as possible! This scarf is so fun and it's reversible! I love blanket scarves because there are so many different ways you can wear them. I especially love this pattern and can imagine paring it with jeans and a white long sleeve top! I seriously think this is the best bootie for transitioning into fall especially if you live in hotter areas. I've worn this pair a few times already and they are so comfy! How adorable is this bootie? I love this style! It's super unique and would pair with so much for fall. I'm a bad blogger when it comes to buying designer bags. I can never muster up the courage to purchase a super high end bag! I eventually will but until then I thought this bag looked super expensive at an affordable price. I love that you can wear it two different ways and the tan color will pair with a ton of looks for fall. Let me know in the comments what your favorite thing about fall is!